The Miami Heat were on a mission. After losing in the 2005 NBA Conference Finals to the Detroit Pistons, Dwyane Wade and Shaq were focused and ready to win in the 2005-2006 season to bring a championship to Miami. Pat Riley returned as coach after Stan Van Gundy decided to step down and the Heat managed to finish 52-30 to make the playoffs. The Dallas Mavericks were a very focused team during the regular season themselves, as they finished 60-22 led by Dirk Nowitzki and Jason Terry. The road to the finals for both teams was interesting, as the Mavericks started off with a sweep of the Memphis Grizzlies in the first round, before going 7 games with the no. 1 seed in the West, San Antonio Spurs. After defeating the Spurs, the Mavs took on the Suns and the MVP Steve Nash, and handled them in a 6 game series. The Heat started off in a 6 game series against the Bulls, then beat the Nets in 5, before obtaining redemption and defeating the Pistons in 6 games to make the NBA Finals. The stage had been set. 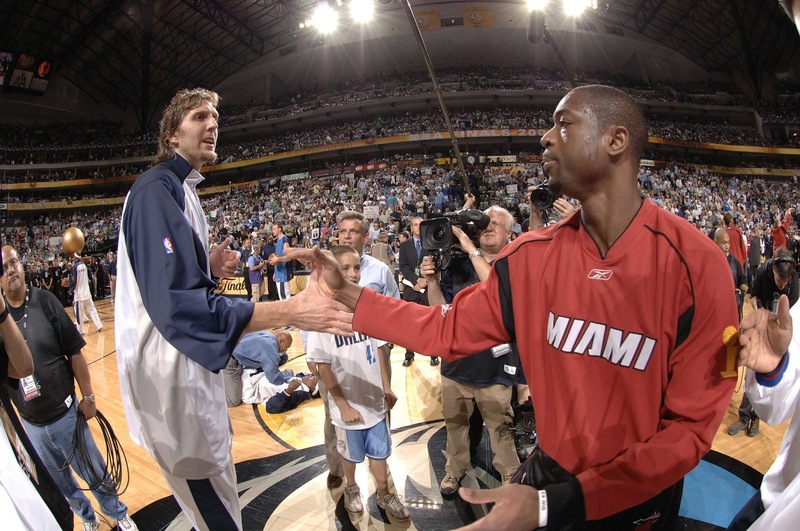 Dirk had a chance to get his ring, Wade would have a chance to get a ring, Shaq would be playing to gain his 4th ring, and even legends like Alonzo Mourning and Gary Payton were coming off the bench for the Heat and looking to finally get their ring. This stakes couldn't have been higher. The starting lineup for the Mavericks featured Jason Terry, Marquis Daniels, Josh Howard, Erick Dampier, and of course Dirk. The Heat's starting lineup featured Jason Williams, Antonie Walker, Udonis Haslem, Shaq, and of course Wade. As game 1 approached, the madness began. -Dallas went in with a mission to destroy and at first, it looked as if they weren't going to get it together, as Miami jumped out to a first quarter lead. Soon, the Mavs would come back taking a lead into halftime and not looking back really. The Mavs managed to secure a 1-0 series lead with a 90-80 game 1 victory, as Jason Terry showed out with 32 points to lead the Mavs. Wade would contribute 28 points for the Heat, but they came up short. -Game 2 would see Dirk step up and the Mavs control most of the game handily after getting out to a huge halftime lead and they never really looked back. After leading 50-34 at the half, they pushed it to 82-58 going into the 4th and despite the Heat's attempt at a comeback, it was far too late, as The Mavs took a 2-0 series lead with a 99-85 victory over the Heat. Wade finished with 23 points and 8 rebounds, but Dirk was on fire as he finished with 26 points and 16 rebounds. The Heat had their backs against the wall now being down 2-0, would they respond in game 3? -The Heat started off this game the right way, taking a nice lead to halftime, 52-43. They seemed more focused at home in the first half and more efficient in their game. However, the Mavs would not be stopped in the 3rd, massively outscoring the Heat by 18 points and finishing with the quarter leading 77-68. The Heat however would not stay down at home, as they regrouped and brought the game closer as it neared the end. 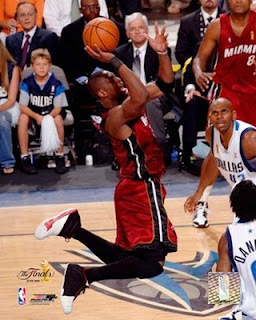 Gary Payton hitting a clutch shot with 9.3 seconds left in the game would seal it for the Heat, while Dirk missing a free throw put the nail in the coffin for the Mavs, as they would lose to the Heat 98-96, still with a 2-1 series lead. For the Heat, they needed to come out and dominate in game 4 to send a message. Dirk ended up with 30 points for the Mavs, while Wade played an amazing game finishing with 42 points and 13 rebounds. 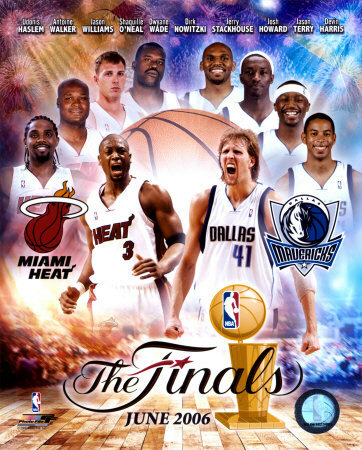 -Game 4 started off close, as the Mavs slowly watched their chances to win go away with every quarter. The Heat took a 54-44 lead into halftime and never looked back, as the Mavs could not find a groove and was held to a record low 7 points in the 4th quarter to solidify the Heat's blowout victory 98-74 to even the series up at 2-2. Wade finished with 36 points for the Heat, as the highest scorer for the Mavs was Jason Terry with just 17. 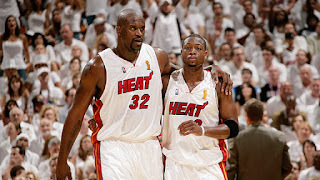 A confidence boosting victory for the Heat was exactly what they needed and they seemed poised to be competitive in game 5. 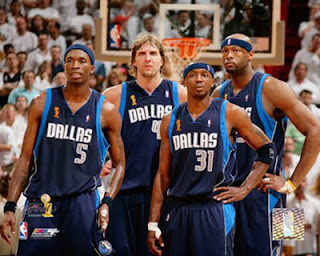 It was now on the Mavs to come back and prove they were legit. -When we speak of controversy and games that were a slugfest, this game fits that. This game was crucial for both teams of course, and both showed up to play hard, as the game would end up going to overtime. In overtime, the controversy would truly begin. 9.1 seconds on the clock in OT with the Mavs up by 1 and Wade gets the ball inbounded to him, but he lands in the backcourt, causing the Mavs to want a backcourt violation. They do not get a backcourt violation call, but there was a very shaky foul called to send Wade to the free throw line(he finished the game with 21 free throws made out of 25, a record) for two. What was supposed to occur here was a timeout after Wade's second free throw, so the Mavs could inbound the ball from half court and try to get a decent shot to win. However, Josh Howard took the timeout before the second free throw was attempted and basically cost them the game as they didn't get to inbound from half court and had to throw up a long bomb shot. Miami took game 5 with a 101-100 win to get a 3-2 series lead and pull one game closer to making history and gaining their first title. 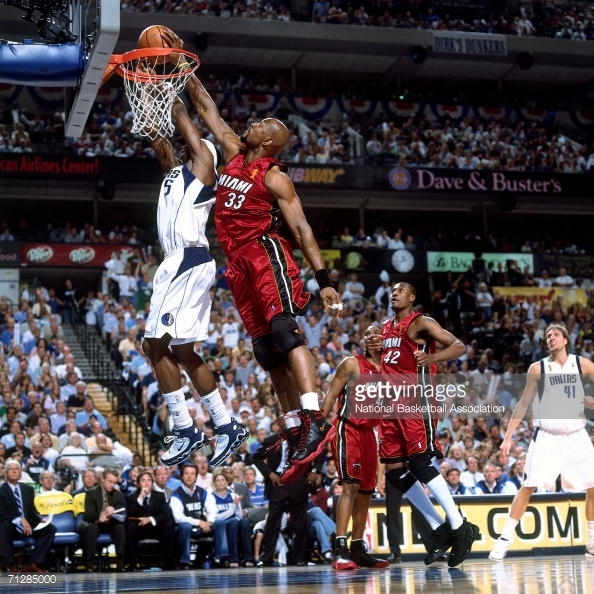 Jason Terry led the Mavs with 35 points while Wade managed to finish with 43 points for the Heat. After some angry responses to the loss(resulting in fines for Dirk and Mark Cuban), the Mavericks now faced a NBA Finals loss after being up 2-0 at first. -The Mavericks came out to play hard in game 6, but it would not be enough. The Heat would clinch the series and their first NBA Championship despite a huge game from Dirk for the Mavs, as he finishes with 29 points and 15 rebounds. Jason Terry had a chance to tie the game and send into overtime, but missed his 3 pointer near the end of regulation as the Heat won game 6, 95-92. Dwyane Wade would finish with 36 points, giving him a 34.7 PPG average during the Finals and earning him the Finals MVP award. 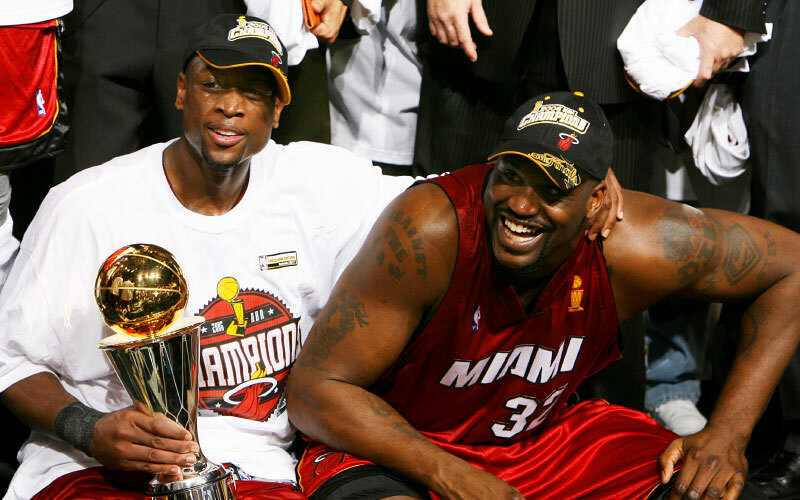 For Shaq, it would be his last true great run and his fourth ring, for Wade it would be his first of three so far, and Alonzo and Payton finally got to win their big one. The celebration kicked off in Dallas, not for the Mavs but for the Heat, who won the series on the road. 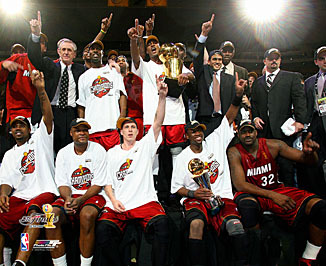 Your 2006 NBA Champions, Miami Heat!